I like to think of today’s cookies as grown-up chocolate chip cookies. Sometimes I think that adults like to pretend that they’ve grown out of childhood foods such as grilled cheese and tomato soup, macaroni & cheese, and chocolate chip cookies, but in reality there’s a little kid in all of us. Even the most sophisticated adults can get away with eating “broiled muenster on ciabatta with tomato basil bisque,” adding mushrooms and gruyere to a classic mac & cheese recipe, and making these cookies, for instance. The food appears dignified and grown-up-worthy, but in reality it’s the same old comfort food from the days of elementary school. Those tricky, tricky grown-ups. 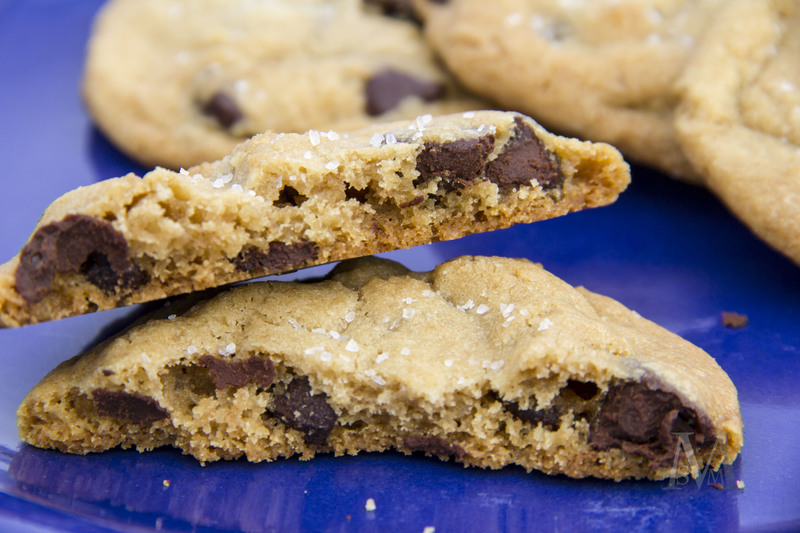 These cookies don’t just sound more sophisticated than regular old chocolate chip cookies; the flavors in these are above and beyond any Toll House-esque recipe! (No offense, Toll House.) 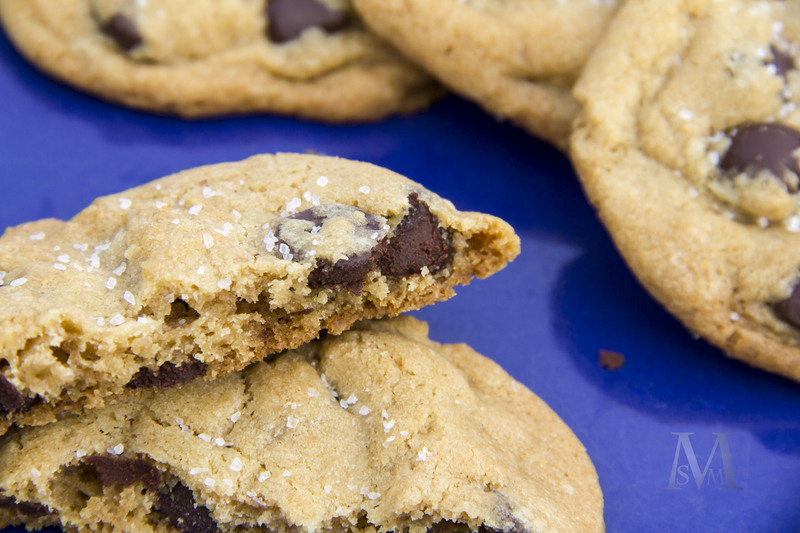 It’s no secret that I’m in love with brown butter, which is a key ingredient in these cookies. 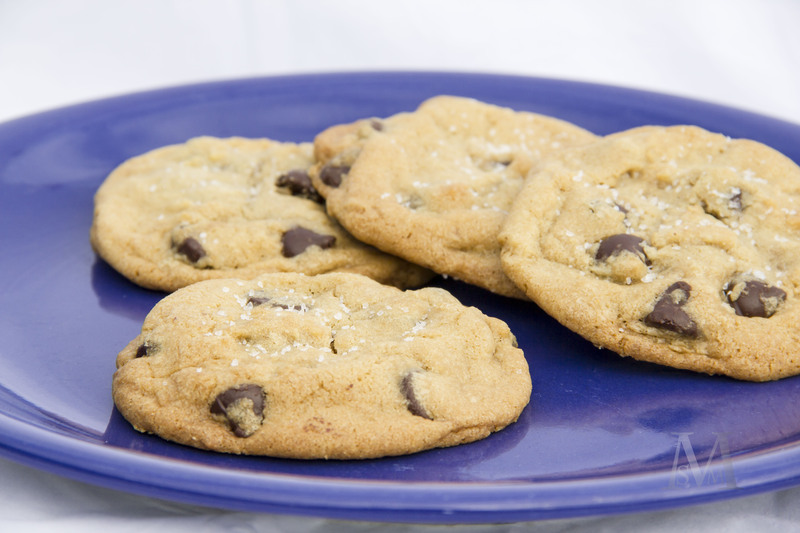 The nutty, caramel notes add such a depth of flavor to the cookies! Little tweaks, such as an extra teaspoon of vanilla for flavor, an extra egg yolk for chewiness, and a bit of greek yogurt for moisture help make these cookies ultra-delicious. The sea salt and dark chocolate combo is amazing, and of course very grown-up. That means that you can shove three of these in your mouth and still be seen as a mature, responsible adult. Go ahead, you have my permission! These cookies are worth it. Melt the butter in a medium saucepan over medium heat. Cook the butter, whisking constantly, as it foams and bubbles. Continue cooking and whisking until the butter turns golden-brown, small brown flecks appear, and it smells nutty. Immediately remove the brown butter from heat, pour into a shallow bowl, and allow to cool completely. Whisk together the flour, baking soda, and salt in a medium bowl. Set aside. In a large bowl, beat together the brown butter and sugars until smooth and creamy. Beat in the egg and egg yolk, scraping down the side of the bowl as needed. Beat in the vanilla and yogurt until smooth. Gradually stir in the flour mixture until just combined. Stir in the chocolate chips and chill for at least 30 minutes. When ready to bake, preheat oven to 350 degrees F. Line baking sheets with parchment paper or silicone baking mats. Scoop dough into balls that are about 2 Tbs large. (I like to roll a dough ball, break it in half, and gently press the halves back together so that the top of the ball is rough and more like bakery-style cookies.) Bake the cookies for 14-16 minutes, rotating the sheets halfway through. Sprinkle the cookies with sea salt. Let them cool on the sheets for 3 minutes before transferring to a cooling rack. This entry was posted in Cookies and tagged brown butter, chocolate chip cookies, chocolate chips, cookies, dark chocolate, desserts, sea salt by emmasbakingaddiction. Bookmark the permalink.